Most US homes have two working parents with children who are busy with sports and after school activities. Due to this busy, fast paced lifestyle parents today find it easier to feed their children already prepared foods and fast food. Many American children are picky eaters making it even harder for parents to get them to eat healthier foods. I try my best to serve nutrient rich meals and include a variety of healthy options for my children. Every time we sit together to a meal as a family at least one of my children refuse to eat what I have prepared. 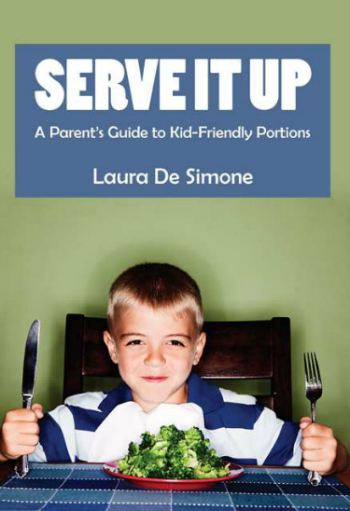 The new book, Serve it Up, A Parent’s Guide to Kid-Friendly Portions suggests that children can eat whatever they want as long as parents serve portion sizes appropriate for their child‘s age and activity level. Serve it Up explains to parents how to serve the correct portion sizes of popular foods based on the USDA’s recommended calorie count. The book provides easy to follow charts with estimated amounts of calories needed to maintain calorie balance for both genders, all ages and all activity levels. Sometimes I give in to my children and feed them what they want instead of what I know they should have. When we have hamburgers, pizza, hot dogs or chicken nuggets I feel guilty because I know that processed foods are not the healthiest for children. But for my children, those foods are their favorites and I feel guilty every time I allow my children to eat what they want. Serve it Up has alleviated my guilt. I now know that many fast and processed food items, if served in the proper portions can still help children maintain a normal body weight and body mass index. If you have picky eaters like I do and are concerned about their diet and childhood obesity, Serve it Up, A Parent’s Guide to Kid-Friendly Portions has the answers that you need. You can purchase Serve it Up, A Parent’s Guide to Kid-Friendly Portions on CreateSpace.com or at your local book store. For more information visit serveitupfood.com. *Disclosure: I received a copy of Serve It Up, A Parent’s Guide to Kid-Friendly Portions in exchange for this review. All opinions are accurate and 100% mine.